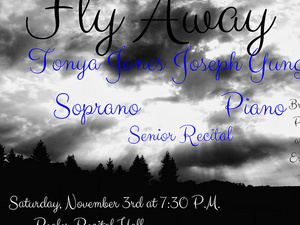 Frostburg State University student Tonya Jones will present her senior soprano recital on Saturday, Nov. 3, at 7:30 p.m. in the Pealer Recital Hall of FSU’s Woodward D. Pealer Performing Arts Center. She will be accompanied by pianist Dr. Joseph Yungen. This event is free and open to the public. Jones’ program will include “Mai” and “Ici Bas” by Gabriel Fauré; “Wie Melodien zieht es mir” by Johannes Brahms; “O del mio amato ben” and “Spirate pur, spirate” by Stefano Donaudy; “Sento nel core” by Alessandro Scarlatti; “Chi vuol la zingarella” by Giovanni Paisiello; “Sebben, crudele” by Antonio Caldara; “Amor y odio,” “El majo timido” and “El mirar de la maja” by Enrique Granados; “Angels Ever Bright and Fair” by George Frideric Handel; “Into the Night” by Clara Edwards; “When I Have Sung My Songs” by Ernest Charles; “O Waly, Waly” and “Come You Not From Newcastle?” by Benjamin Britten; and “Meadowlark” by Stephen Schwartz. Jones studies under Gregory Scott Stuart at FSU. She is the vice president of the collegiate chapter of the National Association for Music Educators. Jones anticipates graduating in May 2019 with a bachelor’s degree in music education and plans to become a fun and educational music teacher. The daughter of Kerry and Greg Jones of Berlin, Md., she is a graduate of Stephen Decatur High School in Berlin.